Some designers seem to conveniently disappear when writing and copy are discussed, and I think this relates to our overall visual natures. Many designers think, relate, and communicate in images — it’s one of the skills that leads to great design and better designers. But while a picture is supposedly worth a thousand words, text isn’t going away anytime soon. So, it’s up to us, as designers, to wrangle the written word and to make the work we do even greater by engaging with the copy. That’s a snippet from an article I wrote for HOW Magazine, about the fear that many designers and creative types have when it comes to writing. We find it’s a common issue among peers and others we rub elbows with, and I believe I’ve got some helpful thoughts to consider. Check it out and comment either here, or at HOW directly. At Hexanine, we are passionate about design and communicating. So, mixing the two makes a lot of sense. We’ll be speaking at this year’s HOW Design Live and are continuing an ongoing discussion about issues around the work we do as designers. We talk at more length about this and other sundry in an interview “workshop” that has just been posted at HOW Design TV. Check the link for a short excerpt, and make sure you join us this summer in Boston! 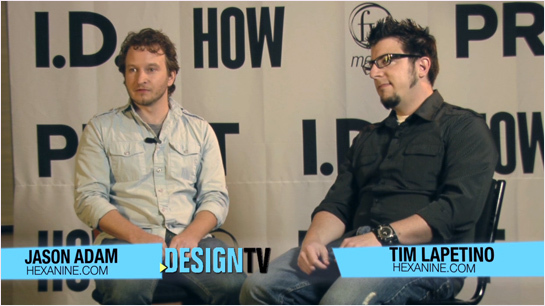 Yes, both of the partners of Hexanine will be speaking together at this year’s HOW Design Live. We’re super excited and ready to deliver the goods at our talk, and it’d be fun if you come too. 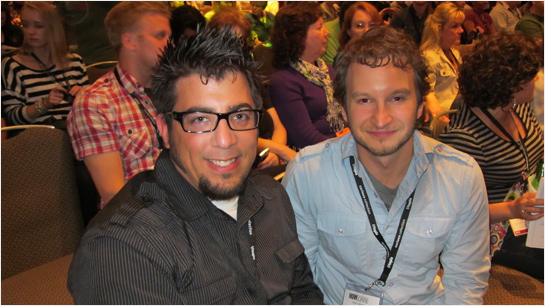 We’ve always left the HOW Design events re-energized, inspired, and with tired arms from carrying cool swag. This year it’ll be in Boston from June 22-25 — clam chowder, that other historic ballpark, and that New England charm. What else do you need to know? As speakers, we’re authorized to give you a super-secret promo code that will get you a $100 discount. Just enter HSPKR in the discount code box during the registration process, and HOW will deduct $100 from your total registration. Combine that with the March 30th Early Bird rate, it’s $170 off — that will buy a lot of Sam Adams beer! Can’t wait to see you there. At this year’s HOW Design Live conference, we got to take some time to chat with our friends at HOW about creativity, inspiration, and why we go to events like this one. This year’s Chicago experience was amazing, and we’re looking forward to attending in Boston next year as HOW authors, as well! Here’s a little edited tease of great HOW authors and creative personalities, including James Victore, Sally Hogshead, Darius Monsef, ourselves, and more. For both visitors and Chicago natives who are gathering for this week’s HOW Design Live, we’ve put together a cheat sheet of our favorite places, food, and things to do in the city. This city is so much more than hot dogs, gangsters, and tall buildings. Chicago has the reputation as the “city that works” and we’re really proud of the title that let’s everyone know that we’re good at getting it done. 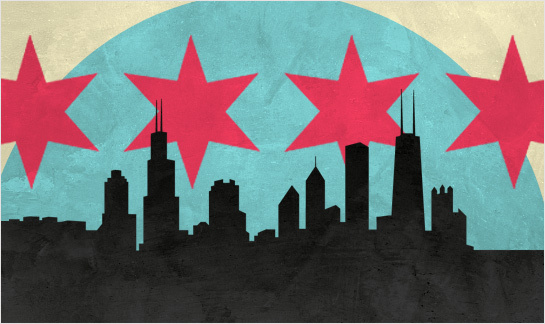 Designers and firms of all stripes call the Windy City home, from well-known agencies like VSA Partners, Crosby Associates, SMBOLIC, and IDEO to trailblazing firms such as Seguara, Inc, Grip Design, 50,000 Feet, Someoddpilot, Coudal Partners (and ourselves, of course). Chicago is even home to creative collectives like Quite Strong and The Post Family. There’s so much to do in this city, so consider the suggestions below just an appetizer of what’s available to do, see and eat in the Second City. Chicago is one of the country’s greatest public transportation cities, so almost anything you want to see or do is accessible via El train, cab, bus, or by foot. We’ve given handy locators below in distance from The Hyatt and HOW Design Live, along with Google Maps links.